Is Humanity Unusual: Talking Alien Civilizations With Harvard's Avi Loeb : 13.7: Cosmos And Culture Commentator Adam Frank talks with Harvard astrophysicist Avi Loeb about exo-civilizations, techno-signatures, and the search for alien life — living or long-gone. 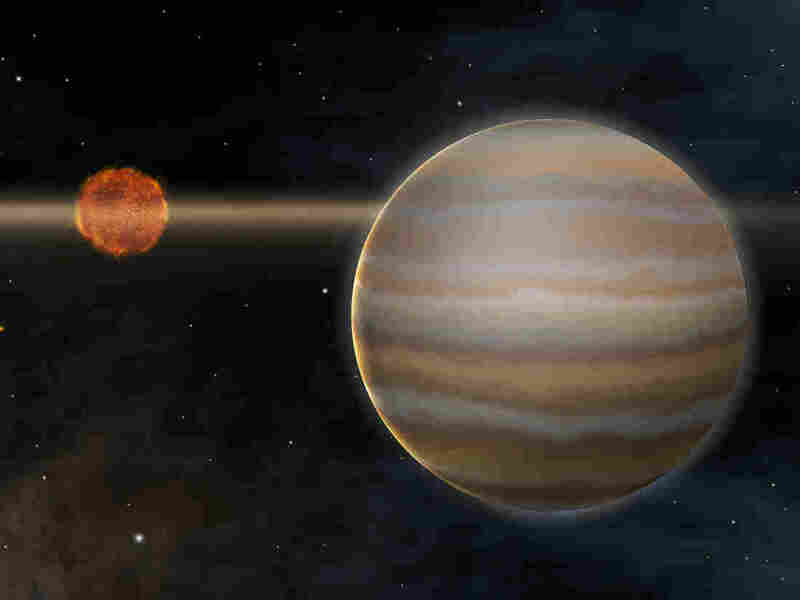 Artist's rendering of the first planet outside of our solar system to be imaged orbiting a brown dwarf star, called the 2M1207 system. The "exoplanet" revolution of the last 20 years has shown us that the universe is awash in alien worlds. More exciting, we now have methods where the atmospheres of those worlds may provide indirect evidence — called "bio-signatures" — for the existence of life. But what if we want to ask about intelligence? What about alien civilizations — or, as I like to call them, "exo-civilizations"? This is something I have been thinking about a lot over the last few years (it's the subject of my new book). In carrying out my own studies, I have often been drawn to the work of Harvard astrophysicist Avi Loeb. When we think of aliens and science, we usual usually think of the Search of Extraterrestrial Intelligence (SETI). This has often meant radio telescopes being used to search for messages purposely beamed at us from an exo-civilization. But unlike these kinds of purposeful signals, a "techno-signature" is an unintentional marker of the civilization's existence. With the discovery of so many exo-planets, astronomers will now be spending a lot time staring at these other worlds in many different wavelengths of light (not just radio). This is how they hope to find bio-signatures. Loeb and Lingam have explored a number of different ways we might find markers of another civilization. What, for example, would be the consequences of a civilization covering large portions of its planet in solar cells to generate power? Lingam and Loeb have shown that light reflected from such a planet would carry a "signal" of all that silicon on the planet's surface, making it an intriguing example of a techno-signature. Over the past couple weeks, I had a chance to ask Loeb some questions about what we should be thinking about when we consider exo-civilizations. With regard to techno-signatures, Loeb was quick to point out that a civilization need not be alive now for us to find its techno-signatures. "There is, of course, Fermi's paradox, which asks where is everybody," Loeb said. One possible answer to Fermi's Paradox is that civilizations don't last very long. But some techno-signatures might remain even after a civilization ends. "Its possible that when we survey planets we may find artifacts of dead civilizations that aren't around anymore," Loeb added. Planet-spanning solar panels offer one example of such possible artifacts, since they could still exist on planet's surface long after the civilization that built them collapsed. One of the most intriguing ideas Loeb raised was that the most common kinds of techno-signatures might not be things we have the sensitivity to find yet. Pointing to what's happening with Elon Musk and Jeff Bezos and their space efforts, Loeb said, "Eventually we may have the ability to launch a lot of things into space." Once a civilization becomes truly interplanetary, there will be many artifacts existing in space rather than on planets. Loeb calls these physical objects "messages in a bottle" because if we had enough sensitivity, we might be able to see them. "These things would be very difficult to detect because they would be putting out very low power," Loeb said. Loeb pointed to the recent discovery of Oumuamua, an asteroid from another star system that was caught wandering through our own. Our ability to find Oumuamua depended on advances in telescope technology. When it comes to techno-signatures, Loeb wonders if, perhaps, there might be spacecraft from other civilizations out there, too. "The interstellar medium might be full of these things but how would we find them?" Loeb asked. In his comments to me, Loeb pointed to the detection of gravitational waves, the ripples in space and time predicted by Einstein's theory of relativity. It took many decades for scientists to develop instruments sensitive enough to detect these signals that come from things like colliding black holes. The gravitational-wave example shows how detection of anything depends technological advances. So when it comes to techno-signatures, as our technologies gets better we might suddenly find lots of signals from the activity of technological civilizations. Loeb is essentially optimistic about the search. "We humans are probably not special," he said, explaining that with so many planets in the universe, the rise of civilizations may not be so usual. But Loeb's belief that we are "not special" takes a back seat to his scientific dedication to data. "I give the final say to the facts," he said. So, for Loeb, the effort now should be developing search technologies and strategies so we can just go out and look. And that's what makes our moment in history so unique. We are poised to start staring at exo-planets and their environments in all kinds of new ways. What do you think we're going to find? Adam Frank is a co-founder of the 13.7 blog, an astrophysics professor at the University of Rochester and author of the upcoming book Light of the Stars: Alien Worlds and the Fate of the Earth. His scientific studies are funded by the National Science Foundation, NASA and the Department of Education. You can keep up with more of what Adam is thinking on Facebook and Twitter: @adamfrank4.